It's focused work on an athlete using whatever techniques necessary to adapt to each individual's specific needs. A lot of massage therapists will tell you about certifications in sports massage, which are important, but how they use and adapt those techniques on you are what's really crucial. It's one thing to know how to perform isolated-active stretching or proprioceptive neuromuscular facilitation*, but knowing when and who to use it on, is the tricky part. You see, not every athlete needs all of the elements of what someone may consider sports massage. Often, nothing more than focused Swedish massage with adjustments to pressure will take care of most aches and pains, while other times there may be a need for stretching or breaking up adhesions or scar tissue. What you'll find when you come to me for sports massage is a therapist who listens to your personal situation and combines it with a working knowledge of the sport in which you are participating. While some see muscle or joint problems similar in approach in all clients, I know that each sport contributes a unique reaction and for your treatment to be fully effective, that must be taken in consideration. *If your MT uses big words, make them explain them to you as well! 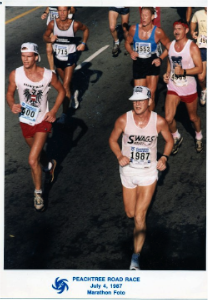 While not in this kind of shape these days, I believe my 20 years as a runner and more as a cyclist, allow me to better identify with the aches and pains of the athletes who come to me for massage. I could try to impress you with the Olympic and internationally ranked athletes I have worked on, but the truth is, those are once in a lifetime opportunities that don't allow many LMTs to track any type of success. What is important are the local runners, cyclist, golfers, etc, who I work with and help keep active in their sport. Client comments: "I went to Kenny because I was two days out from a race and had very tight and sore legs from doing a long run a couple days prior, among other running issues. He spent a lot of time finding out exactly what I needed and then gave me the best lower body massage I've ever had. The next day, all my soreness was gone and by race day I was perfect. I hope to visit Kenny regularly to address all the wear and tear I put on my body through running to keep me going many more years down the road."